Excel provides a robust toolset for illustrating trends. 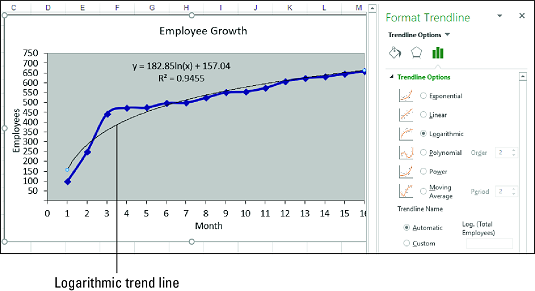 You can do this by plotting trendlines in your Excel charts to offer a visual of your data. Here, you discover how to plot logarithmic trendlines, power trend lines, and polynomial trend lines in Excel. A logarithmic trend is one in which the data rises or falls very quickly at the beginning but then slows down and levels off over time. An example of a logarithmic trend is the sales pattern of a highly anticipated new product, which typically sells in large quantities for a short time and then levels off. To visualize such a trend, you can plot a logarithmic trend line. This is a curved line through the data points where the differences between the points on one side of the line and those on the other side of the line cancel each other out. If your chart has multiple data series, click the series you want to analyze. Choose Design → Add Chart Element → Trendline → More Trendline Options. The Format Trendline pane appears. Click the Trendline Options tab. Select the Logarithmic radio button. Excel plots the logarithmic trend line. (Optional) Select the Display Equation on Chart check box. If you just want to see the trend line, feel free to pass over Steps 6 and 7. (Optional) Select the Display R-Squared Value on Chart check box. Excel displays the regression equation and the R2 value. This image shows a chart with the plotted exponential trend line, the regression equation, and the R2 value. A chart with a logarithmic trend line. y is the dependent variable; x is the independent variable; b and m are constants; and ln is the natural logarithm, for which you can use the Excel function LN. In many cases of regression analysis, the best fit is provided by a power trend, in which the data increases or decreases steadily. Such a trend is clearly not exponential or logarithmic, both of which imply extreme behavior, either at the end of the trend (in the case of exponential) or at the beginning of the trend (in the case of logarithmic). Examples of power trends include revenues, profits, and margins in successful companies, all of which show steady increases in the rate of growth year after year. A power trend sounds linear, but plotting the power trend line shows a curved best-fit line through the data points. In your analysis of such data, it’s usually best to try a linear trend line first. If that doesn’t give a good fit, switch to a power trend line. Select the Power radio button. 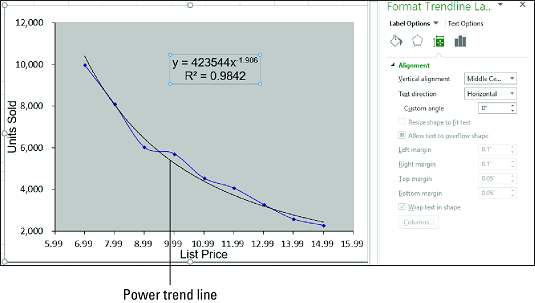 Excel plots the power trend line. If you just want to see the trend line, skip Steps 6 and 7. Excel displays the regression equation and the R2 value (described below). The following image shows a chart with the plotted power trend line, the regression equation, and the R2 value. A chart with a power trend line. y is the dependent variable; x is the independent variable; and b and m are constants. In many real-world scenarios, the relationship between the dependent and independent variables doesn’t move in a single direction. That would be too easy. For example, rather than constantly rising — uniformly, as in a linear trend, sharply, as in an exponential or logarithmic trend, or steadily, as in a power trend — data such as unit sales, profits, and costs might move up and down. To visualize such a trend, you can plot a polynomial trend line, which is a best-fit line of multiple curves derived using an equation that uses multiple powers of x. The number of powers of x is the order of the polynomial equation. Generally, the higher the order, the tighter the curve fits your existing data, but the more unpredictable your forecasted values are. Select the Polynomial radio button. Click the Order spin button arrows to set the order of the polynomial equation you want. Excel plots the polynomial trend line. If you just want to see the trend line, bypass Steps 7 and 8. Excel displays the regression equation and the R2 value. The image below shows a chart with the plotted polynomial trend line, the regression equation, and the R2 value. A chart with a polynomial trend line. y is the dependent variable; x is the independent variable; and b and mn through m1 are constants.